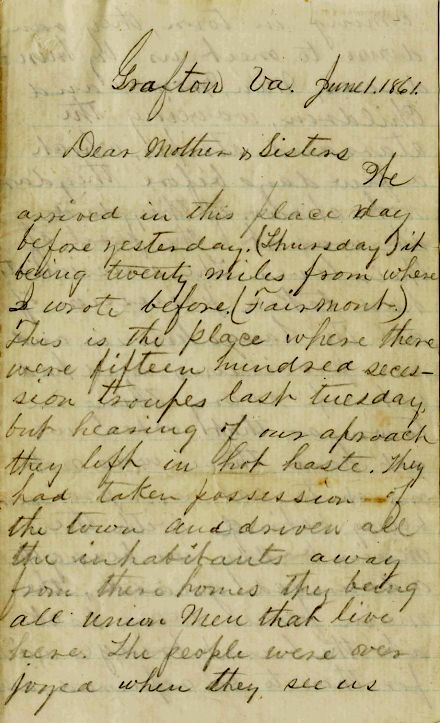 This letter was written from Grafton, (West) Virginia, where the 16th Ohio had arrived on May 30 and was now camped, about 24 miles north of Philippi, (West) Virginia. 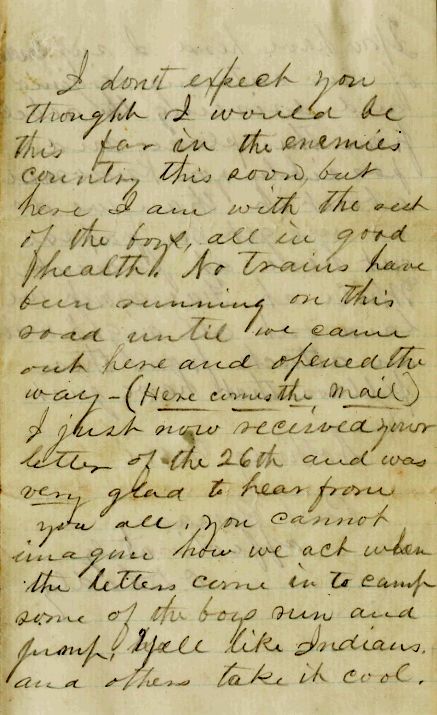 Images of this letter courtesy of Special Collections and Archives, Wright State University. Grafton, Va. June 1, 1861.
shot in trying to escape. 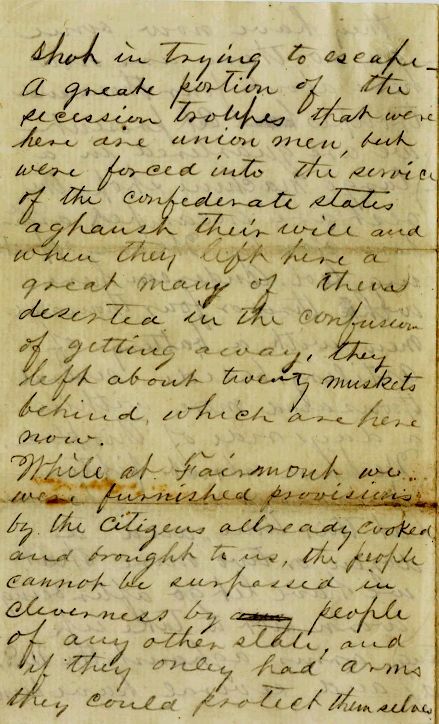 A great portion of the secession troupes that were here are union men, but were forced into the service of the confederate states aghanst their will and when they left here a great many of them deserted in the confusion of getting away. they left about twenty muskets behind which are here now. While at Fairmount we were furnished provisions by the citizens allready cooked and brought to us. the people cannot be surpassed in cleverness by people of any other state, and if they onley had arms they could protect themselves. I don't expect you thought I would be this far in the enemies country this soon, but here I am with the rest of the boys, all in good health. No trains have been running on this road until we came out here and opened the way - (Here comes the mail) I just now received your letter of the 26th and was very glad to hear from you all. you cannot imagine how we act when the letters come in to camp. some of the boys run and jump, yell like Indians. and others take it cool. 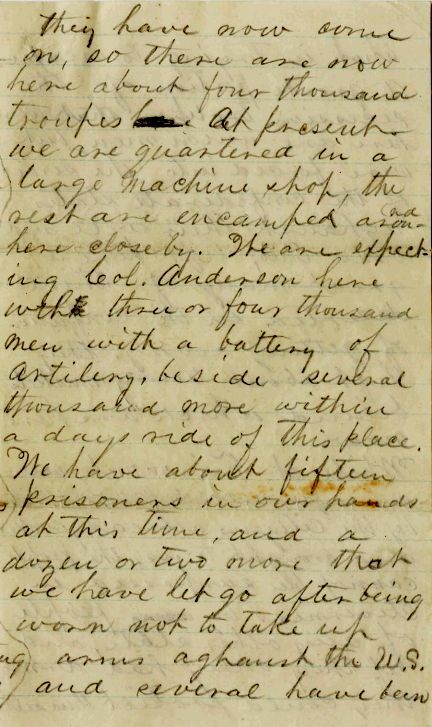 You have heard I suppose of our entering Virginia and driveing the rebels from this place, and possibly you know more about it than we do as we get no papers out here at present. 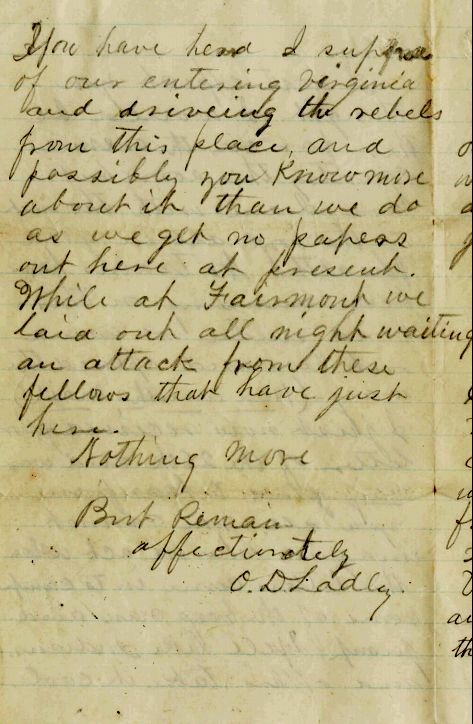 While at Fairmont we laid out all night waiting an attack from these fellows that have just [left] here. P.S. You see I closed my letter in a hurry. 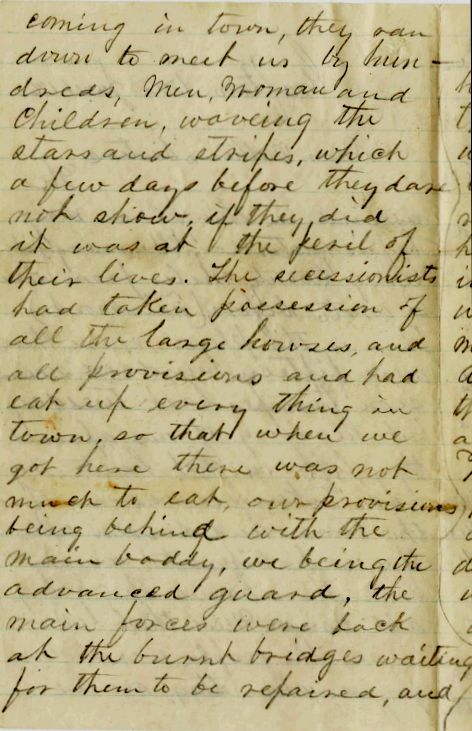 We have just received orders to go on farther and we thought we had to go at once, but we do not leave just yet. 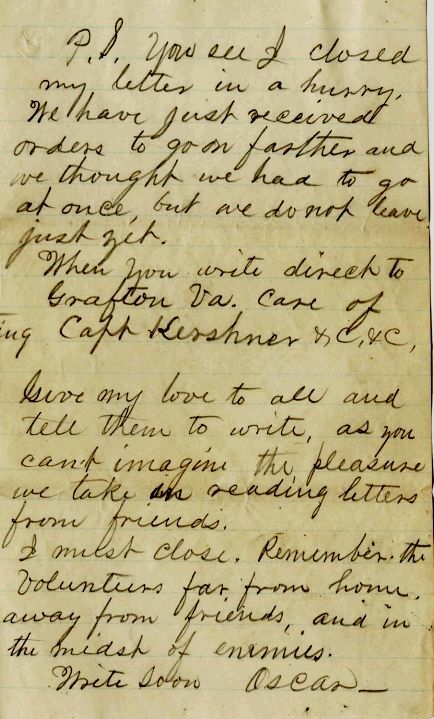 When you write direct to Grafton Va. Care of Capt Kershner &c. &c.
Give my love to all and tell them to write, as you can't imagine the pleasure we take in reading letters from friends. I must close. Remember the Volunteers far from home, away from friends, and in the midst of enemies.